Roy L Hales is the founder of the environmental journalism web platform, The ECOreport.com. He has interviewed hundreds of environmental leaders in Government, Business, and Non-Profit spheres. He likes to get a picture also of what journalists are saying, and so he researches the field itself. Here, Roy shares his thoughts about industrial renewable energy facilities and their impacts in the Mojave Desert and beyond. Roy has two examples. In an interview with Sarah Kiley, Communications Officer for the National Energy Board in Canada, pertaining to the Trans Mountain Pipeline, which Kinder Morgan, a US oil services company, wants to triple in size, bringing bitumen from the oil sands of Alberta to the ports on the coast, and which the cities of Vancouver and Burnaby oppose, Ms. Kiley could not answer the most important question of all,” Hales recounts. Hales describes another interview, one where the official requested anonymity. “What is happening in British Columbia is identical to what’s happening in Blythe, in the deserts of California, where large power tower concentrating solar plants have destroyed Native American antiquities. In speaking with this unnamed federal official, the official agreed to be interviewed, provided I did not reveal his name, nor record the actual conversation, which left me paraphrasing him, of course. 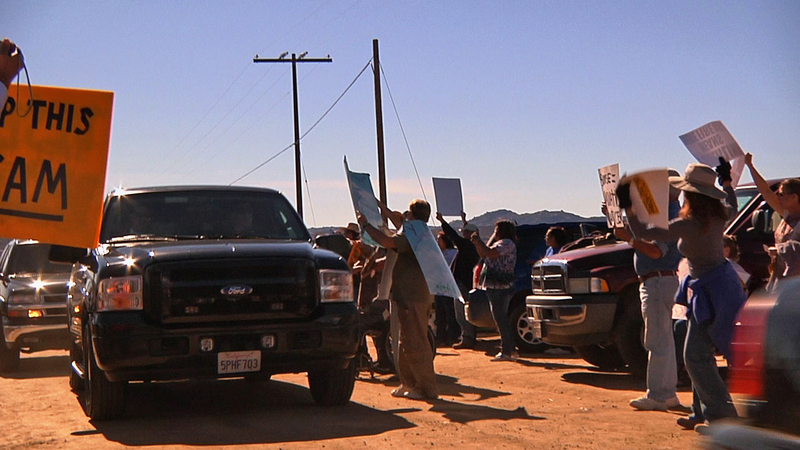 The film features scenes from Boulevard, California, during protests at Rough Acres Ranch, site of the groundbreaking for Sunrise Powerlink in 2010. Speculation at the time was that the true intention of Sunrise Powerlink was not to bring renewable energy from Solar facilities like Imperial II (which was stopped by lawsuit from the Quechan Tribe), but from natural gas plants to be built over the border in Mexico. Hales continues, “This senior Bureau of Land Management official, who deals with desert lands including the Blythe area, and the McCoy Valley, said, ‘none of the work will come within 200 feet of a geoglyph’ and that these ancient artifacts would not be harmed. When I pointed out that many Native Americans see this all as part of a ‘sacred landscape,’ he could see the point. But in the US and Canada, which we may think to be, arguably, more democratic. Democratic protections seem not to exist. What’s wrong with that, an observer asks? The world has always been ruled and regulated as much by democracy or democratic institutions as it has been ruled and regulated by pure power. Are we just being idealistic? Hales continues, “We have a chance here to do something really great. We have a chance to make a society where people matter, in part due to modern communications. We have a chance to make a society where people look after the planet. We have a chance to make a just society. If we let things like this just slip aside, we’ll lose the moment. The moment is right now. If we stand up and see justice done in the little things right now, we have the opportunity. It is an opportunity we’ve dreamed about for ages. We do not have to let Native Americans see their antiquities destroyed. 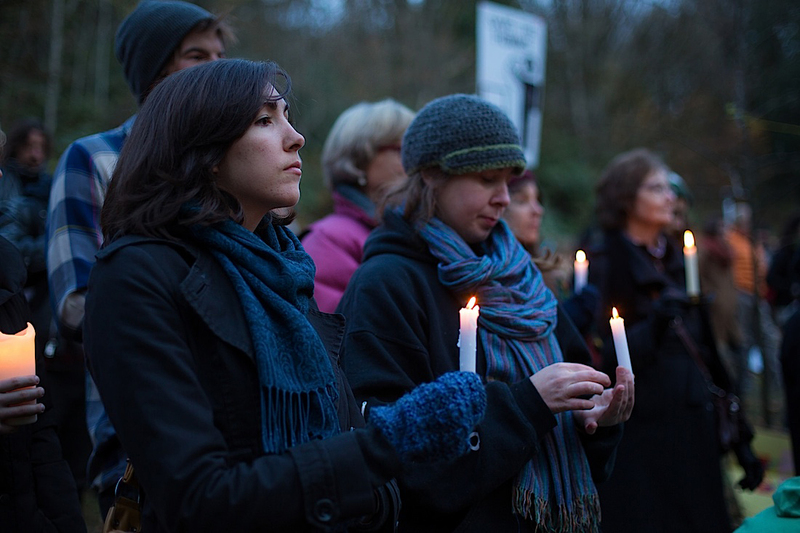 We do not have to let the coastline of British Columbia be destroyed by oil spills from tanker accidents. Do we want justice? Or do we want a society that is ruled by corporations and the powerful? Where we are just little cogs. That is the real battle that is going on. And every one of these battles seems to boil down to the same issue.